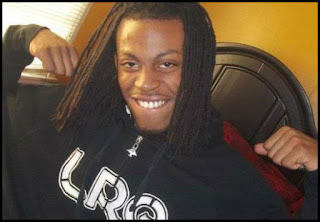 AverageBro: Is Chavis Carter The Next Trayvon Martin?!? Is Chavis Carter The Next Trayvon Martin?!? As a guy who runs a black-themed website, I often get email pleas from readers to bring attention to certain stories. As a rule of thumb (see the AverageFAQ™) I don't typically cover stories about police shootings here. There are obvious notable exceptions (see: Martin, Trayvon) and this, by the sheer nature of it's dubious circumstances, would be one such example. An Arkansas medical examiner has ruled that Chavis Carter, the 21-year-old man killed by a gunshot wound to the head while handcuffed in the back of a police car, committed suicide. Toxicology findings show Carter tested positive for methamphetamine, anti-anxiety medication and other drugs. According to the report by Deputy Chief Medical Examiner Stephen A. Erickson of the Arkansas State Crime Lab, the bullet that killed Carter entered his skull near his right temple, four inches from the top of his head. "At the time of discharge, the muzzle of the gun was placed against the right temporal scalp," wrote Erickson. He went on to state that, "The manner of death is based on both autopsy findings and the investigative conclusions of the Jonesboro Police Department." The autopsy report released Monday included a drug analysis showing Carter hadn't been drinking the night of the July 28 shooting but his urine and blood indicated methamphetamine use. The report says Carter's blood also tested positive for at least trace amounts of the anti-anxiety medication diazepam and the painkiller oxycodone. His urine test also returned a positive result for marijuana. Last week, Jonesboro police released video of a police officer approximately the same size as Carter reenacting what may have happened the back of the police car on the night of July 28, when Carter and two other men were pulled over in a traffic stop. Police searched Carter twice but have said they did not find a gun. The reenactment video shows the officer being cuffed, then sitting in the back seat, retrieving a fake gun from his pants, and bringing the barrel to his right temple. The video also shows still photographs of other officers handcuffed in the backseat of a car, with the fake gun pressed to their temple. Last Friday, police also released the dashboard video from the police car that pulled over the white pick-up truck Carter was riding in. The video shows Carter being patted down by an officer and then led off-camera and questioned. He was put under arrest when police received information that he had an outstanding drug warrant in Mississippi. Carter's family and others have questioned the police story, claiming that Carter was not suicidal and questioning whether it would have been physically possible to retrieve a concealed weapon and shoot himself in the head while handcuffed and seated. It's honestly difficult to draw any conclusion here. It almost seems physically impossible that Carter could have somehow managed to shoot himself in the temple while handcuffed. His mother noted that while Carter was shot in the right temple, he is actually lefthanded. He was also frisked twice by police before being placed in the vehicle, which only makes their story (and curious re-enactment video) that much more dubious. On the other hand, part of me wants to resist wading into this story because it seems like yet another example of a (mounting) groundswell of black blogosphere outrage over a black man with a criminal record finding his demise at the (alleged) hands of evil white cops. There will be cyber petitions, and probably a march or two, and it's all after the fact, which essentially means it's a textbook example of Driveby Activism. Our collective power seems squandered if it's always used on addressing some (alleged) evil at the hands of police. That power would be so much better utilized on proactive measures like the AverageBro Challenge™, a notion I've blabbered about for so long that even I'm beginning to doubt it's effectiveness. Are the two mutually exclusive? Of course not. But it damn sure feels like one gets a lot more hits than the other. I wish the best for Carter's family. They deserve a much better answer than they've gotten thus far. Question: What do you think really happened here? Does the black blogosphere squander its collective power by only getting outraged about (supposedly racist) police shootings, at the expense of more proactive, positive activism?!? The police re-enactment video and the cataloguing of Carter's drug usage have a certain Chappellian "sprinkle some crack on him" element that's hard to overlook. Tags Popped: Drive-By Activism, It's Human Nature, MLK is Crying Inside, That Sh*t Is Racist, The Evil That Men Do, Where Is Obama?